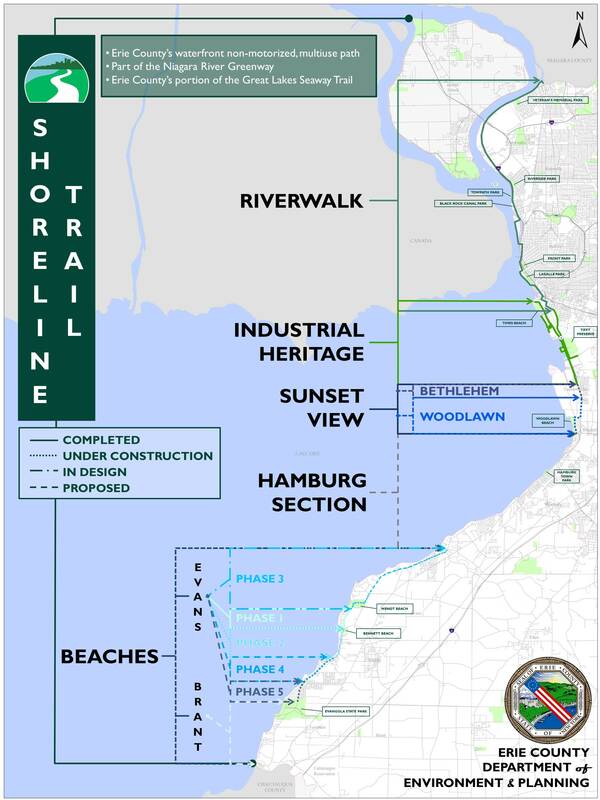 Length: Shoreline Trail [Lake Erie Section]: About 11.5 miles planned. 1.5 miles complete. Shoreline Trail; West Side [Outer Harbor Section]: 7.6 miles mostly paved plus the Bike Ferry to Canalside in downtown Buffalo. Shoreline Trail; East Side [Outer Harbor Section]: 3.1 miles paved to Canalside in downtown Buffalo. Shoreline Trail; [Niagara River Section]: 27 miles paved/on-road. Shoreline Trail; [Robert Moses Recreation Trail Upper Section]: 5.6 miles paved. Union Ship Canal Loop (Outer Harbor Section); 1 mile paved. Tifft Street Bike Path (Outer Harbor Section); 1.3 miles paved/bike lane. Buffalo Harbor State Park Loop (Outer Harbor Section); 0.5 miles paved. Greenway Nature Trail (Outer Harbor Section); 1.9 mile paved loop total. Wilkeson Pointe Loop (Outer Harbor Section); 0.5 miles paved. Goat Island Loop (Niagara River Section); 2.5 miles paved. To Start from the Bennett Beach parking lot (Lake Erie Section); From I-90 take exit 57A to Eden Evans Center Rd and head west for 3.6 miles. Continue straight on Beach Rd to the end then head right on Lakeshore Rd. Travel 0.7 miles to Bennett Rd. Parking lot is on your left. To Start from the Union Ship Canal parking lot (Outer Harbor Section); From Buffalo take Route 5 south to the Tifft St/Fuhrmann Blvd exit and turn right on Tifft St then left on Fuhrmann Blvd. Follow underneath Route 5 and the parking lot is on your right. To start from the Niawanda Park/Two Mile Creek Greenway parking lot (Niagara River Section); From I-190 take exit 17 to River Rd and head right. Travel 1.2 miles and turn left just after crossing 2 Mile Creek and where the trail crosses the road. To Start from the Niagara Gorge Discovery Center parking lot (Niagara River/Robert Moses Rec. Trail Lower Section); From I-190 take exit 23 to Packard Rd west 1.4 miles. Head right on Route 62 (Walnut Ave) to Main St and turn left. Turn right onto Robert Moses Pkwy and the parking lot will be on your left. To Start from the Kiwanis Park parking lot (Robert Moses Rec. Trail Upper Section); From I-190 take exit 25B to Route 104 (Lewiston Rd). Exit to Route 104 (Center St) west. Take your first right on n 9th St to Mohawk St and turn right. Take a quick left on Garden St, stay straight on Oxbow St and the parking lot is on your right. The Shoreline Trail is a continuous multi-use pathway along Lake Erie and the Niagara River, within both Erie and Niagara Counties. Unfortunately there is no single web page that accurately describes this trail. The best map I could find is from the web site the placename.com (See maps below). The trail shares space with several different named trails; Canalway Trail (Buffalo to Tonawanda), Riverwalk (City of Buffalo), Niagara River Greenway (Lake Ontario to Lake Erie), Robert Moses Recreational Trail (Niagara Falls north) and the Industrial Heritage Trail (South Buffalo). For more information visit; SHORELINE TRAIL , OUTER HARBOR , RIVERWALK , NIAGARA RIVER GREENWAY , ROBERT MOSES RECREATIONAL TRAIL , ERIE CANALWAY and GO BIKE BUFFALO . 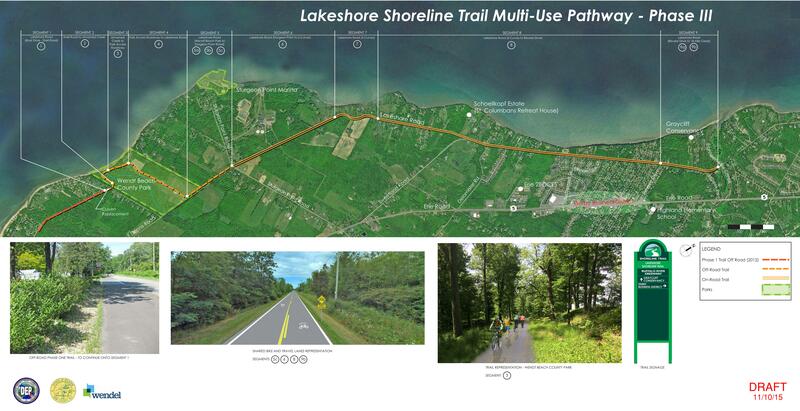 Starting from Evangola SP (Irving); The paved Shoreline Trail begins at the intersection of Lakeshore Rd and the access road to Farnham Point. I haven't checked out this section. The trail travels north 0.5 miles alongside Lakeshore Rd to the entrance for EVANGOLA STATE PARK . Currently a gap exists north as of August 2016. Future construction of Phases 4 & 5 would extend the trail from Evangola SP to Evans Town Park. Continuing north on-road along Lakeshore Rd (narrow shoulder) you'll come to Evans Town Park at 3.6 miles. 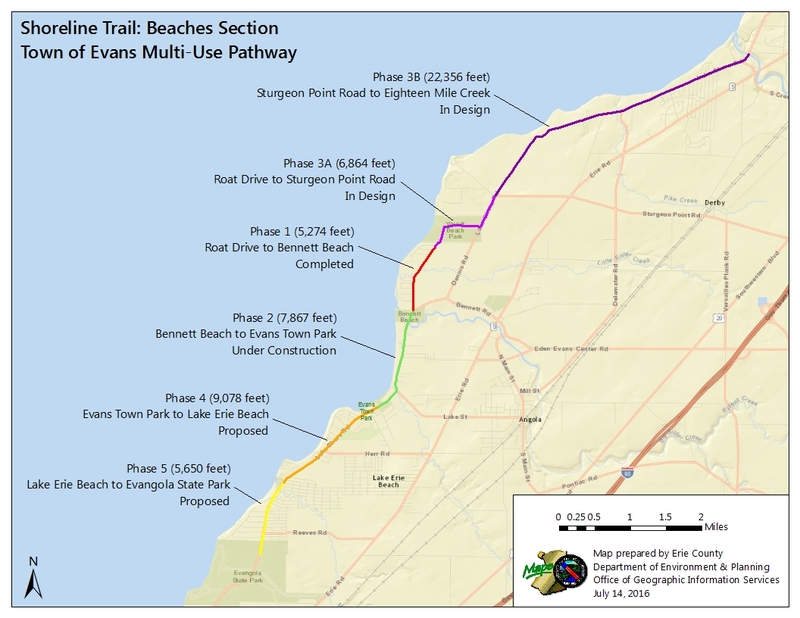 The next section is planned for construction in 2016 as Phase 2 and will travel from Evans Town Park north to Bennett Beach. Continuing north on-road along Lakeshore Rd you come to the intersection with Lake St. Head left along Lakeshore Rd (no shoulder). You'll come to Bennett Rd and the entrance to Bennett Beach parking lot on your left at 5 miles. Here you'll pick up the wide paved Shoreline Trail that travels alongside Shoreline Rd. Come to Roat Dr at 6 miles where the trail currently ends. Currently a gap exists north as of August 2016. Future construction of Phase 3 will continue the trail up to Shell Rd (at the curve) and then head into the woods bringing you to Wendt Beach County Park. From there you'll follow the access road back out to Lakeshore Rd, head left and continue north alongside Lakeshore Rd to Eighteen Mile Creek. CLICK HERE FOR PHASE 3 PLANS . Continuing north on-road along Lakeshore Rd you come to the intersection with Dennis Rd and head left along Lakeshore Rd (no shoulder). Pass by the access road to Wendt Beach County Park at 6.8 miles. Continue north and you'll pass by the Eighteen Mile Creek parking lot at 11.4 miles before crossing over Eighteen Mile Creek. Currently a gap exists north to Woodlawn as of August 2016. I haven't seen any plans for this section of the trail. Starting from Bayview Road (Woodlawn); I haven't checked out this section. The paved Shoreline Trail begins alongside Bayview Rd just off Route 5 (Lakeshore Rd). Follow to Hoover Rd and head right (north). The trail briefly shares the road through an industrial area before traveling alongside Route 5 at 0.4 miles. Come to a traffic circle and the entrance to Woodlawn SP at 0.8 miles. Pass by a pedestrian bridge over Route 5 before coming to 7th St at 1.5 miles where the trail currently ends. Currently a 1.1 mile gap exists north to Dona St. Continuing north on-road along Route 5 a wide shoulder is available until you approach the Lackawanna town line and the industrial corridor at 1.6 miles. Here it's all on-road and narrow. This is the old Bethlehem Steel property which is undergoing redevelopment. You pick up a shoulder after Adams St at 2.3 miles before crossing Smoke Creek. RR tracks to your left. Pass by Dona St on your right at 2.5 miles where you'll pick up the Shoreline Trail again. I haven't checked out this section. This paved section parallels Route 5 north 1.5 miles to the the Union Ship Canal at 4 miles. I've checked out this section. Note; Right takes you along a boardwalk on the Union Ship Canal Loop. Travel underneath Route 5 where the open trail becomes paved as it travels along the Union Canal. Pass by parking lots and a pedestrian bridge that crosses over the canal. Continue straight where the trail loops around the head of the canal past an old industrial foundry ladle. Right is the Ship Canal Pkwy parking lot. You now travel back along the opposite side of the canal passing by the Union Ship Canal parking lot. A boardwalk takes you back underneath Route 5 returning you to the Shoreline Trail after a 1 mile loop. Continue straight to a boardwalk and iron pedestrian bridge over the canal. Lots of informational signs located along this section of trail. Note; The Union Ship Canal Loop comes in from the right after its loop. Cross Fuhrmann Blvd and pick up the paved trail again. Note; Heading right along the paved trail underneath Route 5 will bring you to the Union Ship Canal parking lot. Head left traveling below Route 5 along a wide open trail through an industrial corridor undergoing redevelopment. Pass by a pedestrian tunnel underneath Route 5 that leads to the Union Ship Canal parking lot. Cross Tifft St at 4.4 miles and you'll come to the Tifft Street Pier. Note; Right a paved trail takes you underneath Route 5 [South Buffalo] to the Tifft Street Bike Path. A paved path that travels east alongside Tifft St to the George Harman Sports Fields. A narrow bike lane then continues over multiple RR tracks out to Hopkins St at 1.3 miles. Note; Right underneath Route 5 [South Buffalo] also brings you to the paved Shoreline Trail; East Side that travels north along the east side of Route 5 paralleling the Shoreline Trail; West Side. Either continue straight along the paved Shoreline Trail; West Side or left along the boardwalk past the pier as both routes rejoin the paved Shoreline Trail; West Side as it follows alongside Fuhrmann Blvd. Pass by the Gallagher Beach parking lot where the paved trail continues and a boardwalk now travels above the beach. Pass by Gallagher Pier (pavilions) and a boat launch where both trails converge as you come to Buffalo Harbor SP at 4.9 miles. Note; Left takes you along the paved Buffalo Harbor State Park Loop Trail. The trail travels along the Outer Harbor and around the park which contains picnic pavilions, playgrounds and restrooms. After 0.5 miles you'll return to the Shoreline Trail; West Side. Continuing straight the trail take you past the park. Note; Right a paved trail takes you underneath Route 5 [Tifft Nature Preserve] to the TIFFT NATURE PRESERVE , as well as, the paved Shoreline Trail; East Side that travels along the east side of Route 5. Continuing straight you come to an intersection. Note; Left leads to the Buffalo Harbor State Park Loop Trail and a paved trail that travels through the Safe Harbor Marina. Continue right alongside Fuhrmann Blvd and past the Safe Harbor Marina. Come to a map board and Ohio St at 5.5 miles. Note; Right a paved trail takes you underneath Route 5 [Old First Ward] to the Shoreline Trail; East Side. [To reach Canalside in downtown Buffalo you'll need to follow this route, otherwise you'll have to take the Bike Ferry at the end of the Shoreline Trail; West Side. Be sure to check its hours of operation] I haven't checked out this section. This trail originated from Fuhrmann Blvd & Tifft St and traveled 1.1 miles to Ohio St passing by the TIFFT NATURE PRESERVE . It continues north alongside Ohio St crossing over multiple RR tracks and a lift bridge over the Buffalo River at 1.7 miles. Come to Michigan Ave at 2.5 miles. Here I believe you need to cross the street and continue straight to a narrow fenced in path that takes you alongside the Buffalo River past the NFTA-Metro rail yard, underneath Route 5 and through Canalside to the Commercial Slip at 3.1 miles. Continuing straight alongside Fuhrmann Blvd on the Shoreline Trail; West Side you'll intersect with the paved trail that traveled through the Safe Harbor Marina. The paved trail turns to pavers at 5.8 miles along a section referred to as the Industrial Heritage Trail. Note; Right the paved Industrial Heritage Trail takes you underneath Route 5, then left (north) between Route 5 on your left and some RR tracks and the Buffalo River Ship Canal on your right before traveling back underneath Route 5 and returning to the Industrial Heritage Trail/Shoreline Trail; West Side after 0.4 miles. Continuing straight along the Industrial Heritage Trail section which contains informational signs and sculptures you come to a pedestrian tunnel underneath Route 5 [City Ship Canal] at 6.4 miles where the Industrial Heritage Trail loops in. The paved Shoreline Trail; West Side continues north coming to the Greenway Nature Trail parking lot at 6.2 miles. Note; Left a paved trail takes you along the Greenway Nature Trail to an intersection and map board. Heading left the trail travels alongside the Outer Harbor before ending after 0.4 miles. Heading right you travel past open fields and the Outer Harbor before looping back to the Shoreline Trail; West Side after 1 mile. Continuing north you cross Outer Harbor Dr past another tunnel underneath Route 5 [City Ship Canal]. Come to an intersection at 6.7 miles. Note; Right a paved trail leads past a parking lot and underneath elevated Route 5. I haven't checked out this section. Right the trail travels just a short distance before ending. Left the trail travels along the east side of Route 5 past RCR Yachts and the Buffalo Ship Canal before turning left back to the Shoreline Trail; West Side just before S Michigan Ave. This trail travels 0.4 miles total along the east side of Route 5. You then pass by where the Greenway Nature Trail loops back out to the Shoreline Trail; West Side. Come to Wilkeson Pointe at 7 miles. Note; Left a paved trail takes you along the Wilkeson Pointe Loop. Pass by some restrooms, a water fountain and a parking lot before the trail splits. Following the outer trail you travel past playgrounds and sculptures before coming to the point overlooking the Outer Harbor. The trail then loops back past the playgrounds, turns left past a beach and finally right back out to the Shoreline Trail; West Side for a 0.5 mile loop. You then pass by where the Wilkeson Pointe Loop rejoins the Shoreline Trail; West Side. Here you'll also find the entrance to the Times Beach Nature Preserve which contains stone-dust walking paths. The trail briefly utilizes a boardwalk before ending in front of the entrance for the US Coast Guard. Here you'll find a walking trail that leads out to the Buffalo Lighthouse. Heading right brings you to the QUEEN CITY BIKE FERRY and the end of the trail after 7.6 miles. To continue along the Shoreline Trail you'll either have to return south to the Shoreline Trail; East Side which will take you to Canalside in downtown Buffalo or you can take the Bike Ferry across the Buffalo River directly over to Canalside in downtown Buffalo. Be sure to check hours of operation. It only cost $1 in 2016. The boat docks in the Commercial Slip right next to the Buffalo & Erie County Navel & Military Park. Starting from Canalside/Commercial Slip (Buffalo); This is the official start of the Canalway Trail. Map board located here. Facing the Bowstring Truss Bridge over the Commercial Slip, to your right is the excavation site of the original Steamship Hotel building foundations, which are presented alongside several interpretive exhibits showcasing the historical significance of the Erie Canal. The Commercial Slip was a remnant of Little Buffalo Creek, which flowed into the Buffalo River just before the larger stream entered Lake Erie. The Commercial Slip formed one boundary of Buffalo's infamous Canal District, and was filled in when the district was marked for urban renewal in the 1950s. The Erie Canal Redevelopment project unearthed building foundations from the Canal-era neighborhood and restored the Commercial Slip. Across Marine Dr you'll find Canals with a freezing system that were built to replicate historic canals. The canals have water in the spring and summer and ice in the winter for skating and ice biking. To the south is Harbor Center and First Niagara Center. You may also rent bikes at BLUE BIKE RENTAL . Note; To reach the Shoreline Trail; West Side which continues along the Outer Harbor across the Buffalo River you'll need to access the Bike Ferry. The ferry docks across the Bowstring Truss Bridge next to the Commercial Slip. See; QUEEN CITY BIKE FERRY for hours and fees. Note; To access the Shoreline Trail; East Side travel south through Canalside along the boardwalk next to the Buffalo River and underneath Route 5. See; Outer Harbor Section above. Heading north along the Shoreline Trail/Canalway Trail you cross the Bowstring Truss Bridge over the Commercial Slip to a wide brick lined patio followed by a wide cement patio and a large submarine top. I've checked out this section. This brings you to Marine Dr where you'll find a bike lane and the green trail signs. Head left past Veterans Park and the ships & planes of the BUFFALO & ERIE COUNTY NAVEL & MILITARY PARK . If you use the paved path through this park please walk your bike, as the trail is narrow and crowded with pedestrians. Come to Erie St and head right along a paved trail which then leads you across Erie St to Lakefront Blvd at 0.4 miles. Cross Lakefront Blvd and continue left along the paved trail. When the trail narrows look right and you'll see where the trail heads away from the road (no sign) and travels alongside some RR tracks just below I-190. Cross Lakefront Blvd again at 1 mile and travel through an open field to La Salle Park where the trail travels between Amvets Dr and the entrance to the Black Rock Canal. Parking located here. Travel around the park to Porter Ave where you head inland past the Buffalo Yacht Club. Cross Rotary Row and the trail turns left past pocket Rotary Park at 2.2 miles. I haven't checked out this section. Travel north past Frank Lloyd Wright's Fontana Boathouse and the West Side Rowing Club and you'll come alongside Black Rock Canal again. A ramp & bridge takes you up and over I-190 and the RR tracks then underneath the Peace Bridge. You'll pick up a wide sidewalk alongside Busti Ave which brings you to Niagara St. Note; Currently you need to travel on-road along Busti Ave and Niagara St, however, in the Fall of 2018 construction began on a Cycle Track (protected bike lane) along this section that will bring you to the Robert Rich Way Lift Bridge over to Unity Island. See; NIAGARA STREET PLAN . You'll need to travel north on-road along Niagara St for 0.4 miles to Robert Rich Way on your left. Had left underneath I-190, across the Black Rock Canal to Unity Island and Broderick Park at 3.6 miles. The Black Rock Ferry was located here and traversed the river to Fort Erie from 1825 until the 20th Century. The dock was used as part of the Underground Railroad. Note; Head left to check out the park and Bird Island Pier, which forms the stone break for the Black Rock Canal. The pier is a 4' walkway atop the stone break that travels 1.2 miles traveling underneath the Peace Bridge. Head right past the sewage treatment plant and alongside the Niagara River. You pass by the Unity Island parking lot at 4.7 miles before traveling underneath the International RR Bridge which crosses the river to Canada. Note; After you cross the access road there are some paved trails on your left that will bring you to the northern tip of the island where you can check out Black Rock Lock. A stone pier leads to the canal's end where it enters the Niagara River. About 0.6 miles one-way to the end of the pier. I haven't checked out this section. Continue straight up alongside the RR tracks and across the RR/car bridge where you'll cross over Black Rock Canal. A ramp then takes you down to an intersection at 5.1 miles. Note; From here you can access the start of the Jesse Kregal Pathway which follows Scajaquada Creek out to Delaware Park. Just head left underneath the RR/car bridge. Continue straight down the ramp out to Niagara St and head left along another ramp to a pedestrian bridge over I-190 and down to Dann St. To your left is Black Rock Lock. Follow Dann St out to Hamilton St where you'll pick up the paved trail across the road. The trail travels below I-190, crossing Austin St and Hertel Ave. Note; Left down Hertel Ave brings you to Tow Path Park. Looking south you'll spot Unity Island and the Black Rock Canal. The Black Rock Canal extends 3.5 miles from Buffalo Harbor north to the Black Rock Lock, which was constructed in 1908-1913. The canal allows vessels to bypass the reefs, rapids and fast currant of the Niagara River. The trail takes you around Harbor Place Marine just below I-190 before traveling underneath an exit ramp for I-190 and coming to Aqua Lane. Head left to Black Rock Canal Park which contains several parking lots. Here the trail travels just below I-190 and above the Niagara River. At mile 6.9 you pass by a pedestrian bridge over I-190 that leads to Riverside Park. Pass by Stingers Marina where the trail turns inland coming alongside River Rd. Very industrial corridor. Travel underneath a RR bridge followed by the I-190 bridge before entering Isle View Park at 10.7 miles. Multiple parking lots, boat launch, dock, picnic tables and gazebos. I've checked out this section. Across the river is Grand Island. The trail meanders through the park alongside the river before crossing a bridge over Two Mile Creek and coming to a map board at 12 miles in Niawanda Park. Multiple parking lots, a boat launch, dock, band shell and restrooms located here. Note; This is the start for the Two Mile Creek Greenway which travels right out across Niagara St and alongside Two Mile Creek. Continuing north you come to the juncture of the Niagara River, the Erie Canal and Ellicott Creek at 13.5 miles. Across the river is Tonawanda Island. The Erie Canal utilizes the Black Rock Canal north from Buffalo Harbor and back along the Niagara River which then splits around Grand Island. The Canal utilizes the river along the eastern side of the island. Head right (east) along the Erie Canal and Ellicott Creek passing by an old RR turn bridge out in the middle of the canal. Travel underneath Seymour St heading right out to Niagara St in Tonawanda at 13.8 miles. Note; From here you have two options for continuing north along the Shoreline Trail. Option 1: Head right across the Seymour Street Bridge, which has a narrow cement sidewalk with no barrier and no shoulder for on-road, to River Rd. After 0.3 miles you'll pick up the paved Shoreline Trail on your left just before Goundry St.
Option 2: Head left where the trail follows a wide sidewalk along Niagara St to Main St and Gateway Harbor. Head left across the canal to Sweeny St and turn left. Travel on-road (low traffic) passing underneath the Seymour St Bridge and past the Wardell Boat Yard before rejoining the paved Shoreline Trail which brings you up to River Rd and Goundry St after 0.5 miles. More kid bike friendly. Note; The Canalway Trail; Rochester-Buffalo continues east from Gateway Harbor crossing over Ellicott Creek. I haven't checked out this section. Continuing north from Goundry St [Utilizing Option 2; Mile 14.3] the paved Shoreline Trail travels alongside River Rd through North Tonawanda. Pass by the US Marine Corps Memorial before passing by Fisherman's Park at 15.4 miles. Come to Gratwick Waterfront Park at 16.1 miles where the trail leaves the road and travels alongside the Niagara River through the park. Parking lots, boat ramp, pier, playground and picnic pavilion. You exit the park at 17.1 miles where the trail currently ends. You'll need to travel left on-road (wide shoulder) alongside River Rd (Route 384) which turns into Buffalo Ave (Route 265). Pass by Griffon Park at 19.8 miles. A split off the Niagara River follows the parks boundaries creating Cayuga Island across the river. To your right across the La Salle Expressway is Love Canal (site of Superfund disaster). Cross over Cayuga Creek at 20.4 miles. Turn left along Buffalo Ave (Route 265). This on-road section travels through a densely populated suburb of Niagara Falls. Use Caution Biking. You'll pick up the paved Shoreline Trail on your left at 21.8 miles just before an overpass. This brings you to the La Salle City Park parking lot. Note; If you continue straight under the overpass and underneath I-190 you'll come to a paved trail on your left that leads to the I-190 bridge across the Niagara River to Grand Island and BUCKHORN ISLAND SP where you'll find bike trails. I haven't checked out this section. Travel down through the park where the trail continues alongside the Niagara River. Grand Island across the river. You travel underneath the I-190 bridge then between the river and the Robert Mosses Pkwy. Pass through the Water Authority Overlook Parking lot at 23.3 miles. Pass by the Old Stone Chimney and a Parking lot before coming to an intersection and traffic circle for the Robert Mosses Pkwy, John Daly Blvd and Riverway at 25.2 miles. Right takes you into downtown Niagara Falls via John Daly Blvd. Continue straight along the river and Riverway as you travel along Niagara Falls SP. The rapids will increase as you approach the Falls and you'll spot Goat Island across the river. Travel underneath the 1st Street Bridge before coming to Goat Island Rd at 26.1 miles. I've checked out this section. Note; Be sure to take a detour left along the Goat Island Loop where you can view both the American & Horseshoe Falls. Cross the bridge over the Niagara River to Green Island (If biking use the middle car lane or walk bikes if using the pedestrian lane) then over to Goat Island. Head right along the paved trail which splits. Keep left if biking. This will bring you to an overlook of the American Falls at 0.5 miles. Note; Stairs lead down to an overlook for the Bridal Veil Falls. Continuing left you'll pass by shops, cafes, restrooms and the entrance for Cave of the Winds. Follow the trail closest to the river, passing by the Top of the Falls restaurant, behind which is the parking lot (Fee) and you'll next come to Terrapin Point. A path winds down to the point at 0.8 miles where you can view the Horseshoe Falls. Continue left past the Falls heading upstream along the river (gradual climb) and you'll come to an intersection with Goat Island Rd at 1.2 miles. Head right and you'll come to a stone bridge on your right. Note; This brings you out to Three Sisters Island. Head right over the stone bridge followed by 2 more steel bridges to an overlook of the Niagara River. If you look upstream you'll spot a dam across the river which is located on the Canadian side. Head back out to Goat Island Rd and continue right. You'll pass by a couple more parking lots as you round the tip of the Island. Travel underneath the 1st Street Bridge and you'll return to the Goat Island Road Bridge. Head right and return to the Shoreline Trail after a 2.5 mile loop. Continuing north along the Shoreline Trail brings you to an overlook for the American Falls. Pass by Prospect Point Park where you'll find an observation tower, Maid of the Mist Boat Tour and up to your right the NIAGARA FALLS SP VISITOR CENTER . Travel high above Niagara River Gorge then underneath the Rainbow Bridge at 26.6 miles. You'll come to a set of stairs that you can bypass by continuing straight then heading left. You pass by the Schoellkopf Site and come to the NIAGARA GORGE DISCOVERY CENTER and parking lot (Free Parking) at 27 miles. The Schoellkopf Power Station was constructed in three sections between 1905 and 1924, and at the time of its completion was the largest hydro-electric power station in the world. Water was diverted from the Niagara River above the Falls, by a 4,600’ canal that ran through the city to the edge of the Gorge. On June 7th, 1956, two-thirds of the power station was destroyed by a series of rockslides. In 2013 the original elevator shaft was restored and elevator access to the Gorge and the Schoellkopf Site was granted. From the Niagara Gorge Discovery Center you have several options. A bridge crosses over the Robert Moses Pkwy to the AQUARIUM OF NIAGARA . You can take an elevator down to the Niagara River Gorge from the Schoellkopf Site. There are many trails along or down to the Gorge. Maps located at the Discovery Center Kiosk along with a water fountain or click on the Map Link Below. To continue north along the Shoreline Trail I believe you have 2 options. Option 1: Continue north utilizing the Niagara Gorge Rim Trail which, from the short section I checked out, is a cement base in poor shape that winds through the woods above the Gorge. Overlooks and options for exiting out to the Robert Moses Recreation Trail which parallels to the east. Option 2: Continuing north utilizing the Robert Moses Recreation Trail which is actually the old southbound roadway of the Robert Moses Pkwy. This trail is paved, out in the open and parallels the now divided Robert Moses Pkwy on your right. I believe this trail is part of the Shoreline Trail. The Robert Moses Recreation Trail; Lower Section; Begins from the junction of Main St and Rainbow Blvd in Niagara Falls. The trail heads north coming alongside the Robert Moses Pkwy. I haven't checked out this section. Plans call for removing 2 miles of the northern portion of Robert Moses Parkway and transforming the four-lane highway, between Findlay Drive and Main Street, back into a park and trail. Construction began in 2019. You pass by the NIAGARA GORGE DISCOVERY CENTER and parking lot (Free Parking) at 0.3 miles. The trail utilizes the old southbound roadway of the Robert Moses Pkwy and provides little shade. The Niagara Gorge Rim Trail parallels along the left. You pass high above an old RR Bridge and the Whirlpool RR Bridge that cross the river to Canada at 1.5 miles. Great views back towards Niagara Falls. Cross the entrance road for Whirlpool SP and you'll come to an intersection at 2.3 miles. Note; Right leads to a crosswalk over the pkwy to DE VEAUX WOODS SP . Left takes you to WHIRLPOOL SP . Restrooms. Continuing north you come to DEVILS HOLE SP at 3.5 miles. No restrooms. Right a pedestrian bridge leads to a parking lot. As you approach the NY Power Authority Hydroelectric Dam at 3 miles it appears the path is blocked by a gate, which is too bad as it would give you an excellent view of the Dam the Niagara River below and the Sir Adam Beck Hydroelectric Dam across the river in Canada. The Robert Moses Recreation Trail; Upper Section; Begins off Mohawk St in Lewiston. I haven't checked out this section. The paved trail travels north through a wooded corridor parallel to the Robert Moses Pkwy to the east. Pass by a trail on your left at 0.2 miles that leads to Kiwanis Park parking lot. Some sections of the trail are right next to the pkwy and others are in the woods. After 2.3 miles you'll come to Pletcher Rd. Here the trail leaves the pkwy heading west (left) alongside Pletcher Rd. This is a residential corridor. Pass by the entrance to Lewiston Town Park parking lot at 2.8 miles before coming to Lower River Rd. Note; Left a narrow paved trail travels south alongside Lower River Rd for 1 mile before crossing to a sidewalk. You may continue south utilizing the narrow sidewalk or travel on-road (shoulder). At 1.8 miles turn left onto Mohawk St and travel east on-road (residential/narrow sidewalk) back to the Robert Moses Recreation Trail at 2.6 miles [5.4 mile Loop]. Heading right a narrow paved trail travels north alongside Lower River Rd. Cross the entrance road for JOSEPH DAVIS SP at 4 miles. Just before Park Rd at 4.2 miles the trail crosses over to the west side of Lower River Rd and continues north. When you reach Riverview Dr at 5.6 miles the trail crosses over to a sidewalk. Note; You may continue north utilizing the narrow sidewalk or travel on-road (shoulder). Travel through Youngstown along Main St. After 6.9 miles you'll enter FORT NIAGARA SP . (Fee for cars). You can bike through the park, visit the fort (Fee ), swimming pool (Fee ), picnic...Views of the Niagara River entering Lake Ontario. About 8 miles to Lake.